Irresistible Curiosity Scent | Not Just A Another Scent But An Attractant ! Irresistible 5x Attractant by Heated Hunts is an master crafted blend of top attractants to peak big games’ curiosity and lure them in. 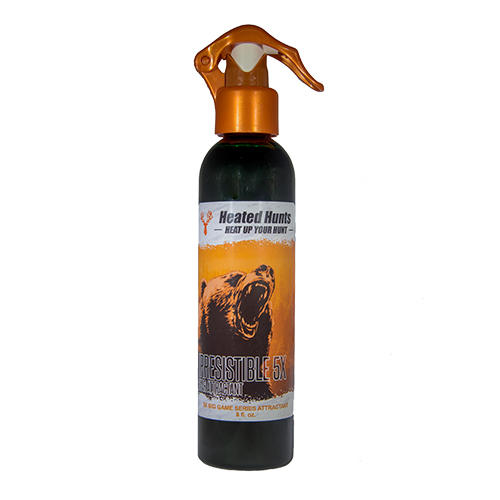 Heated Hunts Irresistible Attractant is a throw back recipe based on generations of hunters that uses tree resins and extracts to attract such vanilla and others. Irresistible Attractant 5x is the extreme of all curiosity scents! In fact, this is a legacy blend of top attractants from generations of hunters and trappers. Further, our Irresistible scent is never diluted, resulting in the strongest aroma. Additionally, we’ve mixed in our performance additives so the sweet corn scent is even more enticing. Both the hunter and the deer can smell the difference! First, the hunter can simply fill 1 fluid ounce of the Irresistible scent into their Heated Hunts Heated Scent Dispenser. Next, the hunter can also spray this attractant while walking into their stand, directly on the ground, or surrounding area.